20 cm xiii, 594 p.,  p. of plates : ill. Reprint. Originally published: London: Little, Brown, 2000. After World War II, Germany lay in ruins. To Konrad Adenauer (1876-1967) belongs much of the credit for raising West Germany to a position of economic prosperity and making it a respected free-world ally. Born in 1876, in Cologne, Adenauer was part of a devout Roman Catholic family. He was elected mayor of Cologne in 1917, a post he held for 16 years, then a representative in the Prussian State Council of which he became president in 1928. After the Nazis came to power in 1933, Adenauer was stripped of all his political positions, imprisoned and then sent to a concentration camp. But after the war he organized a new party, the Christian Democratic Union and in 1949 he became West Germany's first chancellor, retiring after four consecutive re-elections in 1963. 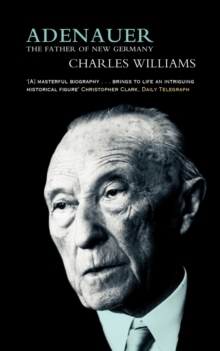 Charles Williams' biography of this 20th-century statesman - and German - is also a history of modern Germany. The book's four sections: "The Kaiser's Germany", "Weimar Germany", "Nazi Germany" and "Adenauer's Germany" - bear testimony to this most singular of nations.